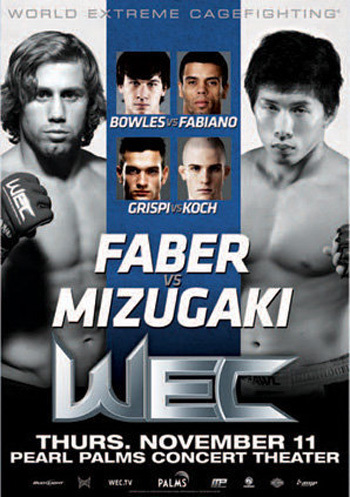 “WEC 52: Faber vs. Mizugaki” took place Thursday night inside The Pearl at the Palms Casino Resort in Las Vegas, Nevada. Former featherweight champ turned 135-pounder Urijah Faber returned to action against Japanese star Takeya Mizugaki in the show’s main attraction. The bantamweights were originally slated to square off at WEC 50, however “The California Kid” was forced to withdraw due to a knee injury. After an unprecedented featherweight title run, Faber lost his belt to Mike Brown at WEC 36 and followed it up with a unanimous decision loss in their mulligan at WEC 41. Faber was steamrolled by reigning 145-pound king Jose Aldo at WEC 48 this past April. Although Faber has dropped three of his last five contests, all coming in championship scraps, he remains the organization’s most popular athlete. Mizugaki holds a respectable 13-4-2 record, however made quite the splash in his WEC debut as a last-minute replacement to challenge then champ Miguel Torres for his crown. Despite dropping a unanimous decision, he won over many stateside fans with his relentless performance.